Last October, a little old game called Ciel nosurge Offline was released for PS Vita, having previously been a PS3 game. While it hasn't been localised in either form, Ciel nosurge is a highly successful JRPG in Japan and if fans of the more recently released and localised Ar nosurge want to find out what happened in the beginning, Ciel nosurge is the game for you as it is the prequel. I actually have memories of Ciel nosurge from lurking sites like Siliconera and Gematsu. The main character Ionasal always catches my eyes because of her beautiful character art. Her gorgeous artwork is part of the reason I ended up reviewing Ar nosurge and thank goodness I did because I had a lot of fun playing that game. Anyway, as I type, I am currently on my long awaited trip to Japan (why aren't I outside doing tourist things, I know, I know). I mentioned in my Gaming New Years Resolution post that I wanted to play a native, unlocalised JRPG from start to finish this year, with Ciel nosurge being my pick. When I went to Akihabara, I had no intention of finding the special edition of the game. In fact, while in Sofmap, I found the regular Vita edition and picked it up thinking my mission was complete. This was until Ionasal caught my eye again in the beautiful artwork of the limited edition Agent pack, just chilling a few shelves away. To my delight, it was barely over 3000-4000 yen (which is roughly around $30-$40AUD) and while it was pre-owned, that price was a steal. It was a no-brainer and just like that, my yen was spent and the game was mine. Is the Agent Pack worth it? I'll get to that. In the meantime, here's what's inside the box! The box from the Agent Pack is my favourite part of this special edition, mostly for it's beauty and it's size. The artwork features Ionasal on the cover with gorgeous light, snowball things surrounding her (I am not proud of that description) while snuggling cutely on a cushion. The back cover details the game, features my favourite Ciel nosurge artwork and lists the special edition contents as far as I can tell (my Japanese is terrible, so if I'm missing any important details, please comment below!). As far as size goes, it's a little bigger than a PS4 game (see photo below) and probably more comparable in length to the size of a DVD. Side note: because mine is pre-owned, there's a slight bump on the bottom of the game's spine, but I don't mind. If you buy it brand new, chances are very high that yours will be in pristine condition. Fun fact - did not know what this is until I read the Play-Asia listing for the Agent Pack. This is the calender, which you can see in the top photo (which is blurry and I'm sorry) comes in a small stand. I'm assuming the idea is that this can be a desk calender, although I won't pretend to understand the significance of the kanji on the calender. Probably a hit and miss for most people. I'm hoping maybe I'll understand it's kanji and significance more after playing the game. 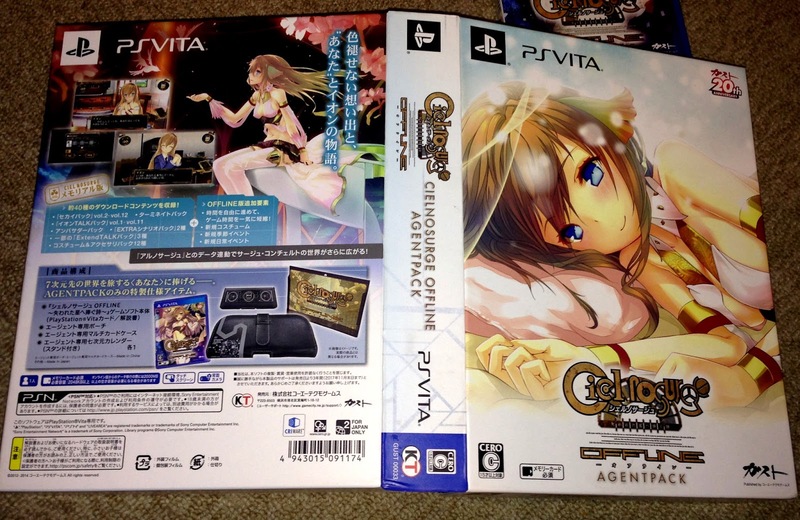 The Ciel nosurge game case is my second favourite item in the Agent Pack, especially since I just filled my other Vita game case! This game case is black and provides room for 6 PS Vita games to be stored. Because the games click into the case (as opposed to sliding in like my other one), I would consider it to be a very secure case. The design on the case reminds me of the some of the design themes in Ar nosurge's geometrics sequence and again, I'm sure will hold more significance further into Ciel nosurge. The pouch is a nice black leather pouch with accents from the game. The game pouch shuts with the attached belt shown in the middle of the photo. It fits my first edition Vita, albeit tightly so I can assume it is designed to hold the newer slim model of Vita. I won't be using this as I have a padded, zip-able case which I think is more secure, however it's a good addition for those who may not own a Vita case or who own the newer Vita model. Looking at the listing price on Play-Asia and other sites, I think this is really one for huge fans of Ciel nosurge or the Surge Concerto series. For fans trying the game for the first time, it's a lot of money for these items and I would only recommend spending that kind of money on a series you really love, unless you truly think the art is beautiful. Of course it's down to personal preference, but I probably wouldn't have paid more than what I paid to get it pre-owned. I feel lucky to own it and really am happy with the items I received at the price I paid. I use the case and the box looks lovely with my growing Japanese game collection. 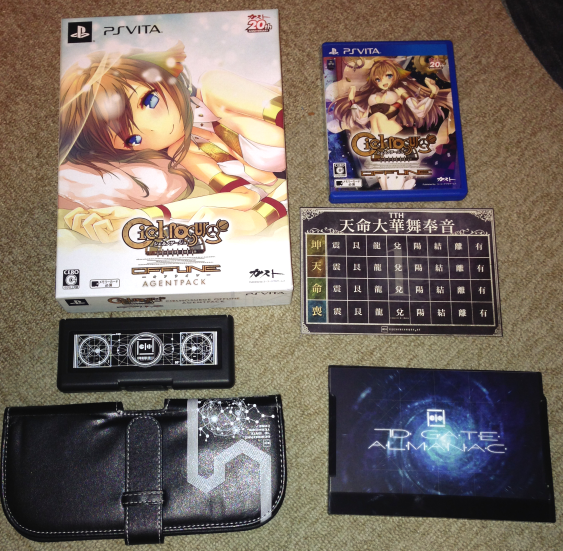 If you want your own, the Ciel nosurge Offline Agent Pack can be purchased from Play-Asia. Please note: the game is in all Japanese, so come prepared! Will you be picking up this limited edition? How much would you want to pay for it? I love hearing your thoughts, so please comment below or send a tweet to @JRPGJungle. Thanks for stopping by!